Stephen Colbert, seen here in a file photo from November 2011, postponed production of his Colbert Report due to concerns about his mother's health, according to reports. The show will resume taping Monday, according to Comedy Central. The Colbert Report is set to resume production Monday, after a hiatus last week brought on by concerns over the health of Stephen Colbert's mother, according to reports. Lorna Colbert, 91, lives in Charleston, S.C., where the Comedy Central star grew up. Colbert received a flood of well-wishers' thoughts on Twitter after his show abruptly ceased production for two days last week. Word eventually spread that Lorna Colbert was ailing, prompting many to offer their support. "My family and I would like to thank everyone who has offered their thoughts and prayers. 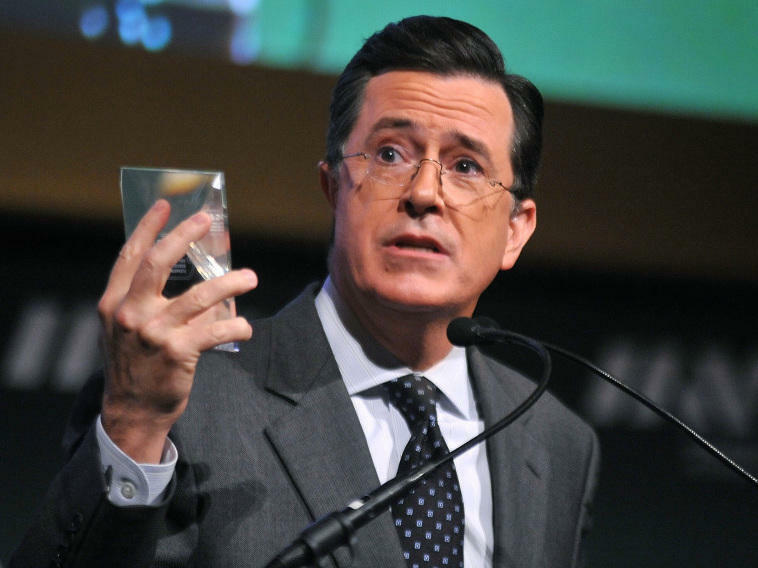 We are grateful and touched by your concern," Colbert wrote on his Twitter account Friday evening. The halt in production seems to have come after the talk-show host spent the previous week down in Charleston. The condition of Colbert's mother is not widely known. "They are a very private family," a source tells The New York Post. "It's not surprising that he did not want anyone to know what was going on." The youngest of 11 children, Colbert lost his father and two brothers in a plane crash in 1974, when he was 10 years old — an event that his older sister Elizabeth described during an interview in 2010. "'I'm not bitter about what happened to me as a child, and my mother was instrumental in keeping me from being so,' Mr. Colbert said. "'She taught me to be grateful for my life regardless of what that entailed.'" In addition to his mother, Colbert has a brother and sister who reportedly live in Charleston. The Colbert Report collected an honor from the Writers Guild of America Sunday night, when the show's writers — a group which, as you'd imagine, includes Colbert — won in the category of "Comedy/Variety (including Talk)" shows.